Despite being sidelined by surgery, Dwayne Johnson is still one tough guy. The actor and wrestler, better known as The Rock, had an emergency hernia operation on Monday, which kept him from attending the Los Angeles premiere of his latest flick, "Pain & Gain." But a photo he posted from the hospital shows he's still a man of steel. 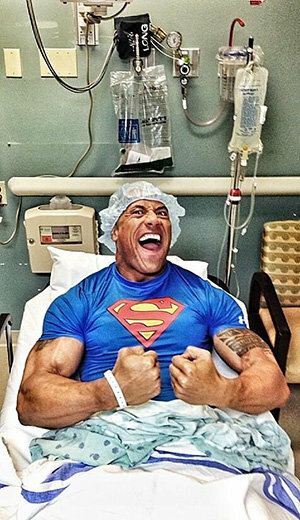 Outfitted in a Superman T-shirt and surgical cap, the 40-year-old channeled another superhero, The Hulk, in the animated picture, which showed him flexing his buff arms as he sat in a hospital bed amid medical equipment. "Surgery a success," he tweeted. "Dr repaired 3 hernial tears (fun pain). Superman is on the mend. #WeFallWeRise"
Johnson's injury didn't take place on a movie set. It was sustained in the ring when he faced off with John Cena during a WrestleMania bout to defend his WWE championship title. Not only did the action movie star lose the match, he seriously injured his abdomen. "In the middle of last night's Wrestlemania match I tore my abdomen & abductor muscles off the bone. Just part of the job," he tweeted in early April. Then on Sunday, he announced that he was going under the knife, and his doctor had to "push my intestines back thru the tear in my abdomen. Kinda romantic."